They were priced to move- so I snagged three wire baskets in slightly different shapes (round, oval, and scalloped). They were grubby as all get out, but as I rolled some ideas around in my head, one kept coming back to me- weaving patterns of ribbon through the “spokes”. I also couldn’t shake the idea that we equally refer to these as “bread baskets” and “bread bowls”- and so the basket/bowl hybrid idea was borne. A farmhouse bowl, in fact – easy to make rustic decor with a simple thrift store makeover. This post contains affiliate links for your crafting convenience. My plan? To give them a modern-rustic makeover with paint and then basket-weave burlap ribbon in and out. Will it work? I wasn’t certain, but I was happy to give it a go nonetheless. First, I gave each metal basket an “aggressively mediocre” polishing and cleaning, and then set up shop for farmhouse-style paint jobs. Why paint them silver when they’re already silver? 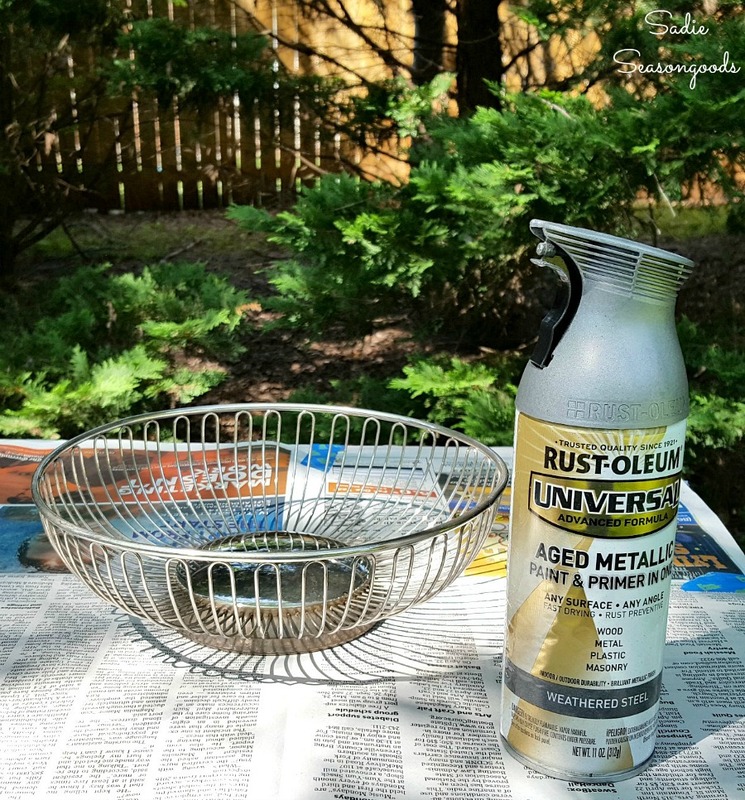 Because when I’m done with my upcycling idea, I won’t be able to polish them again…so using a galvanized metal spray paint will preserve the dark (but clean) silver-grey color that I want. When the paint itself had dried, I gave them two light coats of clear matte top coat to keep the galvanized silver paint from chipping as easily. When all was said and done, I had much farmhouse-ier looking bowls in a darker, weathered, nuanced silver-grey. Now for the basket weaving! I gathered some burlap ribbon and even some ribbon that looked like grain sacks, which would be perfect for the farmhouse bowl idea I had in mind. In order to not waste ribbon, I used some cooking twine to measure out how much I’d need for each ribbon by weaving it through the metal basket. Then, I used the twine as my template for cutting the burlap ribbon. Once I had the burlap ribbon lengths cut, I simply wove it in and out of the silver “spokes” (seriously, is there a better term for them? ), just like a basket. After hot-gluing the ribbon ends together inside the metal basket, I basket-wove the next piece of ribbon directly beneath the first, in the opposite weaving pattern. A few minutes later, I was done! 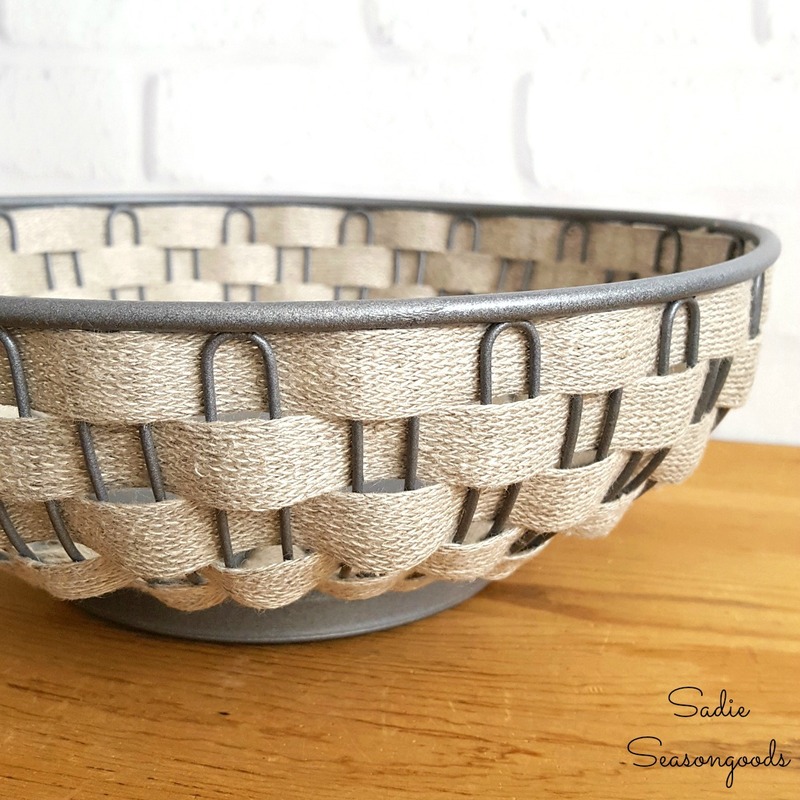 Such a fun take on rustic decor or a farmhouse bowl, and the “basket weaving” only takes a few minutes to complete! Here’s another view of it so you can see my farmhouse bowl from the inside. The oval basket didn’t come out quite as cleanly as I would have liked (being oblong and all), but I really liked the rougher burlap against the galvanized metal. I need to look for a narrower burlap ribbon for oval shaped wire baskets, don’t you think? And while it was hard to photograph, even a single woven burlap ribbon at the top of the scalloped basket looks nice on its own. A change of pace but coordinates nicely with the others! But talk about a basket weaving hack- this is a lot easier than working with natural fibers from scratch! And with farmhouse decor or rustic decor all the rage, you can make a farmhouse bowl (or several!) for just a few dollars with this upcycling idea! A word of warning, however- because of the spray paint and sealer, the surfaces of these baskets would no longer be considered food-safe. Please line basket/bowl with a towel or other material to ensure that food does not come into direct contact with the project. 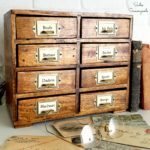 If you enjoy rustic decor or farmhouse decor from the thrift store, you might also enjoy this “thrift the look” blog post of mine, as well! I have a couple of those silver bread baskets. 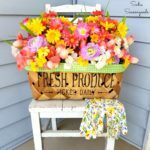 You came up with a great idea to upcycle them to Farmhouse style. Yeah! Clever idea to paint these! I scored two wire baskets recently too, one is a beautiful shiny copper and the other is a gold color with pearls in the spokes. I think they will go on the veranda as planter decorations. I love how you made over the wire basket. Those were very popular back in the 80’s. I think I got 3 when I got married in 1988! Now I wish I had kept at least one and didn’t sell them in a yard sale! Thanks for the invite, Janet- just linked up! I really love the way this looks–great idea. Seriously cool idea! I love it! I have a bunch of those baskets. This is a wonderful idea for an update! A big improvement over what was! How did you measure with twine? Did you hold it up round & round, or did you weave with it first? I love it though. I actually cut a long piece and wove it through- trimming so that there was about an inch overlap. It worked perfectly! Thank you- and YES, it definitely does!! I can relate with not having enough space in the cart sometimes! I once had an old school desk hanging on the edge of the cart so it would smash my goodies inside. Great score on the baskets! Thank you so very much, Charlene! That is so cool!! I love how it turned out!! 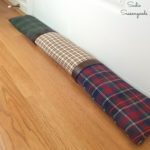 This is such an attractive upcycle project! Those bread baskets have been popular over the years, so they’re fairly plentiful at yard sales and thrift stores. The spray painting and weaving completely change the look. Nice job! Thank you so much! It was one of those projects that I wasn’t 100% sure would go over well…so I’m extra thrilled that you like it! What a clever and lovely way to repurpose that basket, love it! This is such a lovely refresh – it looks amazing! Great finds and you aced this one! Thank you for sharing with us this week at Celebrate Your Story, and I hope your week is going great. It’s me again! 🙂 This will be featured in tomorrow’s Farmhouse Friday link party! I never get tired of hearing that, Michelle- thank you SO very much! Hope you have an excellent weekend. Thanks for the inspiration! Lovely … you better get a few more of these because I already vision them for Christmas, spray painted red, green… in other words, the colours of the season … and weave especially plaid ribbons trough them?! Pine comes, dried berries … endless possibilities, lol! Thank you so much, Heide- and your holiday idea is terrific!! Perfect Perfect Perfect, these are so pretty and you are so clever!!! Perfect gift for my one and only mother, thank you! I’m not a farmhouse kind of girl, but I’m going to paint my wire basket black and weave heavy white ribbon through it. Then I’m going to fill it with lemons! Oh, that’ll look LOVELY, Pamela! !